A national register of people with cerebral palsy is being launched in a bid to help improve care for people with the condition in Wales. Experts say the register is urgently needed so people with the condition get the services they need. Campaigners say there is not enough information about the population of people with cerebral palsy. The Welsh Government said it was supporting the development of the register. It is the most common cause of physical disability in children, affecting one in every 400 in the UK. But the group setting-up the register said it was not known where people with cerebral palsy lived and what their different needs were. Paediatrician Dr Rachel Lindoewood, co-lead on the project, said this could mean unidentified gaps in service provision across the country, which data collection would help to find. "We hope the register will help us... work out where the resources need to be focused to bridge those gaps and get better outcomes for everybody with cerebral palsy", she told the BBC's Sunday Politics Wales programme. "Potentially, by not having those services, people could end up with more complications from their cerebral palsy which could have an impact on their long term ability. "So it is serious and it is urgent." The register will record symptoms, assessments and ongoing care for people living with the condition, collected by health professionals and stored anonymously on NHS systems. 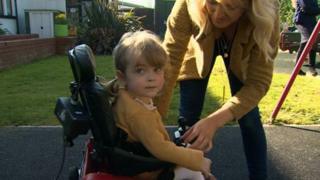 Hayley Jones, whose three-year old daughter Sienna has cerebral palsy, hopes the project will help families and children. She said children with cerebral palsy "require so many services". "Knowing how many people with cerebral palsy, you know then all these services can work together then children could get the right care," she said. The Cerebral Palsy Register for Wales - funded by the Moondance Foundation and set up by a group that includes people with the condition, families and health professionals - will be launched in the assembly on Tuesday, with the first stage of the project due to start in Powys. The Welsh Government said: "We fully endorse the need to collate more robust patient data to better inform treatment and research. "This is an excellent example of the third sector, NHS Wales and patients, all working towards improving services for people with Cerebral Palsy and their families." Sunday Politics Wales, BBC One Wales, 1100 GMT, 3 March. Available on iPlayer after broadcast.